This beautiful 82' Jefferson yacht for sale can now be seen down in Miami! : Atlantic Yacht & Ship, Inc. This beautiful 82′ Jefferson yacht for sale can now be seen down in Miami! 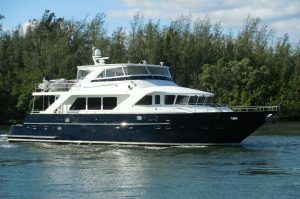 Brad Nelson has announced that this beautiful used 82′ Jefferson yacht for sale has relocated down to Miami! In the first place, this used 82′ Jefferson yacht is a raised pilothouse layout. Moreover, this model was launched in 2004 and is known as a Starship. To sum up, she has a three stateroom /three head layout. In fact there are additional crew (or guest) quarters aft with a private entrance. Furthermore, this quarters has a min-galley, full bathroom, and four single berths! As can be seen this used 82′ Jefferson yacht is in great condition. Powered by twin 1,500 horse power Detroit Diesel engines, this yacht is a powerful cruiser. Additionally, with two generators and bow & stern thrusters, and stabilizers, this yacht has everything. She is also super easy to handle because of these features. You know you are getting quality with Jefferson since they have built over 500 yachts since they opened in 1982. Located at Sunset Harbor Marina in Miami Beach, FL she is easy to see. For more information on this impressive 82′ Jefferson yacht for sale contact Brad Nelson today! $50,000 price reduction on this beautiful used 82′ Jefferson Yacht! Just listed – this beautiful used 82′ Jefferson yacht for sale!